Excimer Laser was born with human's researches to find a real treatment method which is an alternative to eyeglasses and contact lenses.Excimer Laser was actually developed for computer chips by IBM in 1976.Ten years after this date,used in an eye surgery in Berlin for the first time.Beacuse of the success,a lot of company started to produce excimer laser. In the first years, excimer laser was only used for myopia treatments.But today, we use the excimer laser for myopia,hyperopia and astigmatism.It doesn't have important bad effects and also is very successful. By today,excimer laser is applied on over 50.000 eyes in Turkey. are not able to wear eyeglasses or use contact lens becuase of sportive aims or your job. 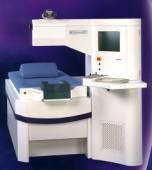 you are able for excimer laser. you are not able for excimer laser. You can see the page Lasik & PRK for additional information.